One of the greatest mysteries in the universe is also one of the most powerful and effective forces in all our lives, whether we know it or not, and whether we are Christian, Muslim or atheist. He hovered over the waters in Genesis 1:2, and today he is mightily at work, (eg in Lakeland, Florida, where there is a major revival going on.) In between he appeared to sizeable groups at the first Pentecost, and more recently in Pond Inlet in 1999. He is the Holy Spirit, or Holy Ghost, and sooner or later you are likely to run into him. If you want it to be sooner, you might want to come to the Glen Cairn Community Centre at 182 Morrena Road, Kanata at 7:30 on Saturday May 31 to hear Bishop Malcolm Harding’s truly remarkable stories of his encounters with the Holy Spirit, and to learn more about the third person of the Trinity. Sadly, the Holy Spirit has been relegated to a supporting role in our sophisticated post-modern church. He is the subject of a sermon typically once a year at Pentecost in those denominations that celebrate that miraculous event. Yet, to become a Christian, we have to be born again, and this is work done by the Spirit. All the more reason to take this opportunity to learn about “The person, power and release of the Holy Spirit” – which is the title of Bishop Malcolm’s address. It will start at 7:30 p.m., Saturday 31 May at Glen Cairn Community Centre, 182 Morrena Road, Kanata. Light refreshments. Heavy anointing. 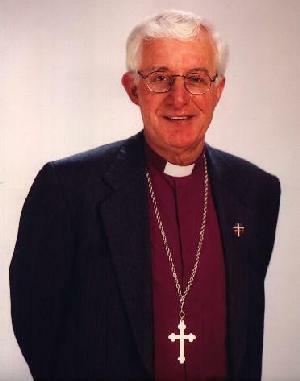 Bishop Malcolm has a rather long title these days: Bishop Suffragan and territorial Archdeacon (Prairies) for the Anglican Network in Canada, (ANiC) and a board director of Anglican Renewal Ministries and former ARM Ambassador. In the latter role he criss-crossed Canada (he calls it the old sawdust trail) invited into 24 Anglican dioceses for a variety of renewal events. Today he is not welcomed in some of those dioceses having crossed the floor to join ANiC under the Episcopal oversight of the Province of the Southern Cone in South America. It is interesting to speculate how a man much revered can be so judged even though he himself has changed not a whit. It isn’t the first time a man of courage has been turned from hero to villain overnight; it happened to Jesus. Sat May 31: 7:30 pm. Bishop Malcolm will speak on "The person, power and release of the Holy Spirit." Where: Glen Cairn Community Centre, 182 Morrena Road, Kanata. Sun June 1: 8:00 – 9:00 am Bishop Malcolm will be Tony Copple's guest on "Over My Head," CKCU 93.1 FM. 10:00 am. Bishop Malcolm will preach at Kanata Lakes Fellowship (The Old Schoolhouse, SS #1, 400 Goldridge Drive, Kanata Lakes.